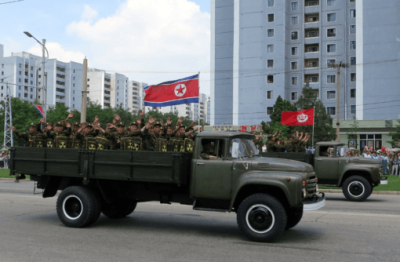 Why the Surprise About North Korea’s Resistance? Bruce Cuming’s The Korean War explains North Korea’s resistance. [i] The history provides reasons and makes it unsurprising. But there’s also a story about that history: about how some histories disappear, and must. Commentators say sanctions don’t work against North Korea. Nothing works. [ii] They don’t ask why. It’s as if there is no history. And it’s as if there are no people, because people have reasons, partly explained by history. There are no reasons because there are no people. The people disappear. With hundreds of nukes installed by the US in South Korea, why would North Korea not seek nuclear deterrence? Kim Il-sung, the grandfather of the current leader, fought the Japanese colonizers for 13 years in extreme conditions. He was a hero of that struggle. Japan had annexed Korea and set up a puppet state. The colonizers finally relinquished control in 1945. But by then the US had interests. It’s an old story, silenced. According to Adam Smith, in no society can people enjoy well-being without being regarded well by others. The wealth people need varies from society to society. But Smith notes that one good is absolute: the ability to appear in public without shame. If this capacity is so central to human well-being, why does it not matter that the system providing a good life for 20% does so by creating hell for the majority. The “developed” live well, or think we do, because the public into which we appear doesn’t include the 80%. We “live well” without shame because those we kill and rob don’t exist – as people. Frantz Fanon remarked that you can brutally exploit others while considering yourself a liberal humanist as long as your victims aren’t human. [iv] If you convince yourself they are “superior monkeys”, he writes, there is no contradiction between embracing imperialism and declaring commitment to global justice. It’s not self-conscious. We mostly think out of habit patterns, unacknowledged. It is why Marx said shame is such a revolutionary emotion. We experience shame when we see the truth, when we see the world as it is, not as we need to see it to be comfort. Fidel Castro referred to sobrantes (left-overs). In the 2000s I attended an annual conference on global development in Havana, Cuba. Castro was there each time, taking notes. When it was over, he’d speak, starting, say, at 10.30pm, concluding at 3.30am. A colleague asked why I listened since I knew his ideas. Why did any of us listen, for hours, all night long, some standing in order not to nod off? It wasn’t to learn. We knew the message. It was to not feel crazy. Listening to the media, and most of the academic left, it can seem that the whole world denies certain histories, Korea’s being just one. I noticed that Castro’s speeches were lengthy because they always included history, and not just Cuba’s. He told histories of resistance. Such histories provide reasons. People have reasons. He was making the sobrantes people. His stories created expectations: that the poor matter, that the poor remember, that the march of humanity (against imperialism) exists and will continue. I thought that’s how it is but when most journalists and academics deny US imperialism – won’t even use the word – one can feel crazy. There’s a thing about truth. Sometimes, when you hear it and give it importance, it creates energy. It becomes possible to act in ways not possible previously, even if intended. Plenty of philosophers have noticed that how we think and how we act are interdependent. Marx was one. Some ask who can galvanize an anti-imperialist left, without Castro. Yet a person is not what’s needed. Truth is needed. Development folk talk about well-being, meaning happiness, or something similar. They may be the “darkly radiant” of Les Misérables. Victor Hugo decries endless talk about happiness, forgetting truth. “They have no idea they are to be pitied”, Hugo writes, “Whoever does not weep does not see”. At the global development conferences, Castro said the march of humanity will continue because “people think and feel”. He draws upon José Martí, who said that without sensitivity, we can’t be educated. Knowledge just doesn’t cut it in this age of information. This point matters. You have to be sensitive to feel the energy of truth, when you find it, if you find it. And you have to care about pursuing it. It can be hard. “how many times had that implacable light … dazzled him by force when all he wanted was to be blind”. It would be good to appear in public without shame. But it may not be compatible with our obsession with happiness, and it is certainly not compatible with our desire to be blind. The fear is that they are the same thing. [i] The Korean War: A History, Random House, 2010; Review. [ii] Bill Clinton negotiated a freeze on plutonian production for eight years and signed an agreement against ‘hostile intent” but these were undone by Bush and Obama. Featured image is from Stefan Krasowski | CC BY 2.0.